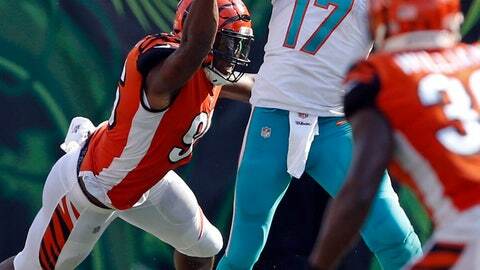 CINCINNATI (AP) — Ryan Tannehill tried to dump the ball at the feet of his tight end rather than take a sack. Instead, the ball flew out of his hand, smacked off a helmet and flew directly to a Bengals lineman for an easy touchdown return. Just like that, everything fell apart for the Dolphins. Tannehill had a pair of indescribable turnovers that Cincinnati’s linemen returned for touchdowns in the fourth quarter Sunday, helping Cincinnati rally for a 27-17 win. Miami (3-2) was in control in the second half, leading 17-0 and doing pretty much everything it hoped. The Dolphins’ many mistakes changed the momentum and left them stunned. “I didn’t know what happened,” Tannehill said of his fumble that rookie Sam Hubbard returned 19 yards for the clinching score. The Dolphins came into the game with concerns about both of their lines. They’d lost two starters on the offensive line, and the defensive line was depleted with end Cameron Wake hurt and tackle Jordan Phillips released after a poor game that included a sideline outburst. Yet, there they were, in control in the third quarter with a chance to finish off the Bengals (4-1), who were out of sync and struggled to do anything consistently. The Dolphins helped them greatly. First, Martrell Spaight drew a 15-yard penalty for taunting a Bengals player after a punt return. A personal foul on T.J. McDonald on a failed third-down play extended Cincinnati’s touchdown drive that turned the momentum. “We were struggling to get anything going,” Cincinnati punt returner Alex Erickson said. Andy Dalton’s touchdown pass to Joe Mixon got the crowd excited and gave the Bengals a sense of hope. The Dolphins knew they’d contributed to the change in momentum. “We had two penalties on that drive that killed us,” coach Adam Gase said. Tannehill’s two turnovers changed everything. Under pressure, he tried to avoid a sack by dumping the ball at the feet of Durham Smythe. The ball hit the tight end’s helmet and deflected directly to Michael Johnson, who ran 22 yards untouched for the tying touchdown. “It’s probably a play where he just needs to eat it and take a sack,” Gase said. Tannehill then lost a fumble when he was hit by Carlos Dunlap, the ball flying directly to Hubbard for the clinching touchdown return. “I heard the crowd cheer and everyone run away from me, so I knew something bad happened,” said Tannehill, who was 20 of 35 for 185 yards. Miami made the big plays early, but couldn’t close it out with a 17-0 lead. Kiko Alonso picked off Andy Dalton’s tipped pass near the end zone to stop Cincinnati’s opening drive, Vincent Taylor blocked a Bengals field goal attempt, and Jakeem Grant returned a punt 70 yards for a touchdown with 23 seconds left in the first half. The Dolphins suffered another injury to their line when left tackle Laremy Tunsil went out with a concussion in the fourth quarter, another factor in their implosion.